So, you eat local. You’re an AW member. You signed that online petition to save the polar bears from drowning – that one everyone shared on Facebook. You even sent a check for twenty bucks to that conservation group after your last pay day. But you flew 7,000 miles to Uganda last year for a kayak trip. You almost always drive separately from your friends because biking shuttle is such a drag. And you drove 12 hours to Gauley Fest by yourself because you wanted to go run the Upper Yough the Monday prior. OK, OK. That last one was me, not you. I mean, it’s kayaking. It’s seven parts driving, one part paddling, and at least two parts drinking beer, right? Well, it doesn’t have to be that way. That’s right! You can replace all seven parts of driving with eco-friendly world-saving transportation. Allow me to introduce Carbon-Neutral Kayaking. 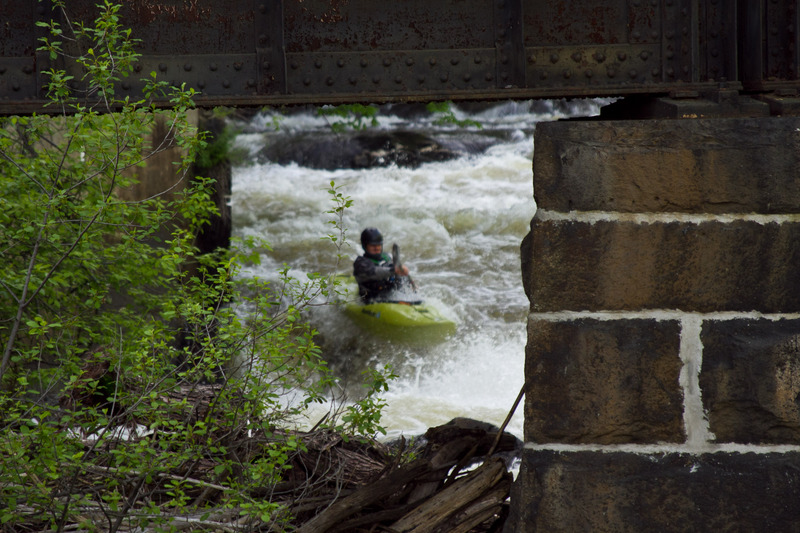 Billy Wagner urban paddling on the Mascoma River in Lebanon, NH. At the time, we lived a 6 minute walk from the put-in to this stretch. The concept is simple. Go kayaking, but don’t drive anywhere. There’s one key requirement: live near a river. The exact maximum distance varies depending on your tolerance for carrying your kayak. Here are the five best reasons to practice carbon-neutral kayaking. 1. It’s a great way to get in the newspaper. Maybe this is more common for other folks, but the last time I was in a newspaper was in high school, and it was an article about the debate team. If you want to be the next legend of your town’s newspaper, try trudging down the street in a snowstorm with your kayak on your shoulder. I guarantee someone will write an article about how awesome (crazy?) you are. If you’re not driving to the put-in, you’re getting exercise, whether it’s carrying your boat a few miles or portaging and paddling your way upstream from the takeout. If you’re lucky, you live in a spot where you can do both – I’m currently living at the takeout of Otter Creek Gorge in VT and most days I paddle and portage my way up, but sometimes its nice to switch it up and get that Cali training in. 3. When your friends want to go paddling, you can just tell them to meet you at your house. If they’re meeting you at your house, there’s no way you’ll be late. And, if it’s miserable and sleeting outside, as it usually is when I go kayaking, you have the added bonus of being able to change in the nice, heated indoors. 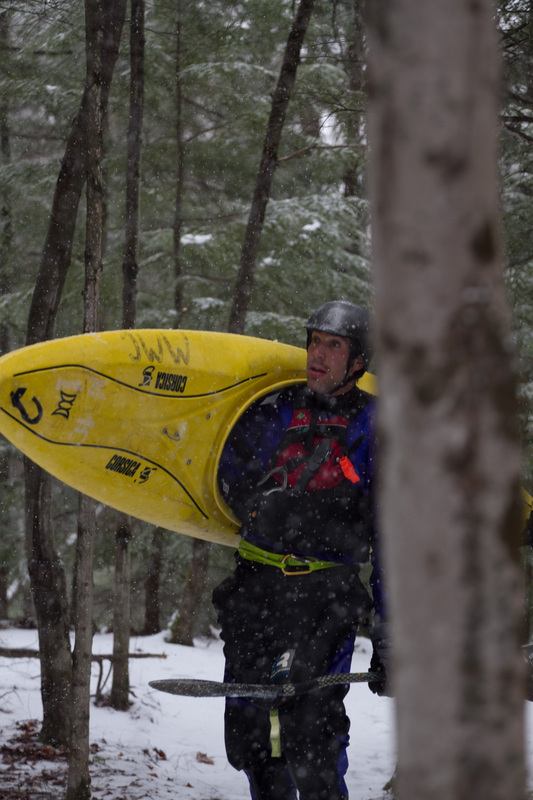 Greg Sokol loves carbon neutral kayaking. Look how much fun he’s having! 4. There’s always a cold beer at the end of your paddling trip. Whether you live at the put in, the takeout, or a couple miles away, there’ll always be a cold beer waiting for you at the end of your paddle, attainment, or hike back home. If you happen to be out of beer, you can always stop at a gas station while you’re hoofing your boat through town! And the icing on the cake: you don’t even have to worry about getting one of those pesky open container violations during your drive home. 5. You get to brag to all your friends about how you’re saving the world. “Yeah, so that’s pretty cool that you did a no portage descent of Fantasy Falls. But I went paddling yesterday and didn’t drive at all. Do you know how many baby seals you killed? That’s right.” There’s no better route to the moral high ground than carrying your kayak a couple miles to go attain class II in twenty degree weather. 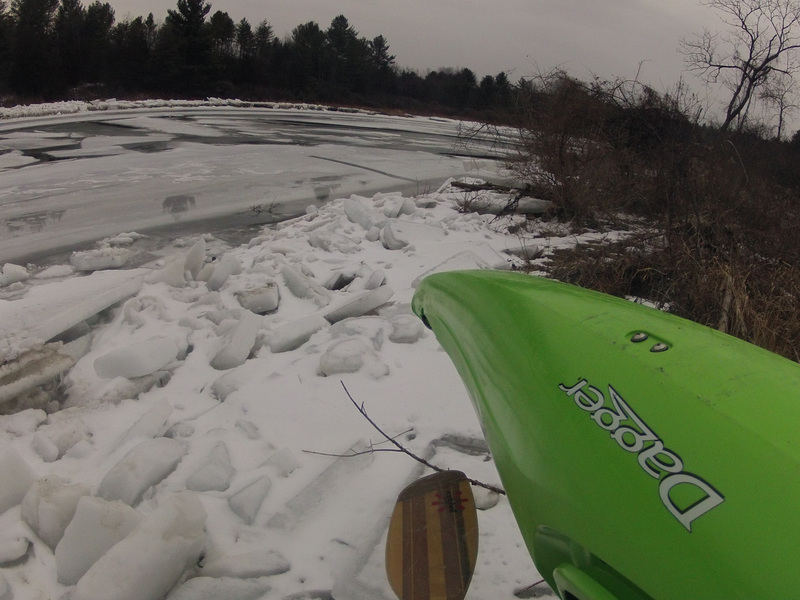 Some days are just not meant to be kayaking days. But at least I only walked 100 yds to get skunked. So, when you’re next deciding where to live, go ahead and browse the classic Mountainbuzz and Boatertalk threads arguing about what corner of the US is best for paddling. But give some real thought to living close to a river, wherever you choose. Being able to paddle every day with no time, money, or gasoline wasted on driving is pretty great, and just might be worth living that extra hour from your favorite creek or play spot.